Last summer I posted pics of a red racer/coachwhip snake I found up in a tree. 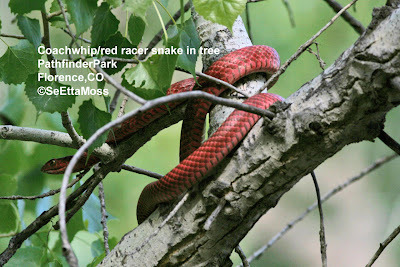 Yesterday in Pathfinder Park in Florence, CO a California birder I was talking to spotted the red racer snake in these pics. As we watched, the snake watched us back and soon slithered down the tree and vanished in the vegetation much to the astonishment of the birder's daughter, Marissa. 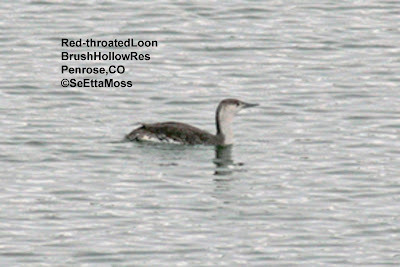 I went back out to Brush Hollow Reservoir before Memorial Day week-end to try for some better views and photos of the Red-throated Loon that is far south of where it should be at this time of year. I was rewarded with closer views, only 2-400 feet away, as the loon preened, stretched and did a little diving when there were fewer fishermen on the shore and in boats to chase it into the middle of the lake. This allowed me to get pretty good pics with my telephoto lens combo (totally over 600 mm eqivalence) when I cropped and lightened them. 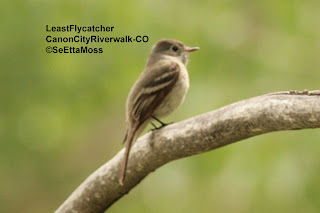 Least Flycatchers migrate through eastern Colorado during migration. I found this bird on the Canon City Riverwalk, a little far west of where they are usually seen. The past several days have been quite cool and rainy--what is most often the weather around Memorial Day. The fronts that have brought this weather also brought more waves of migrating landbirds including a number of warblers like the two in these pics that I photographed yesterday. Though not common during spring migration (they are very common here during fall migration), Wilson's Warblers breed in the more mountainous areas of Colorado. 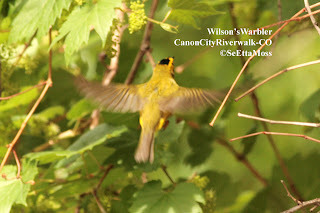 I caught the male Wilson's in the top two pics as he flew between branches while engaged in very active foraging.